The Dynamic Host Configuration Protocol (DHCP) is a standardized networking protocol used by servers on an IP network to allocate IP addresses to computers. The purpose of DHCP is to automate the IP address configuration of a computer without a network administrator. IP addresses are typically selected from a range of assigned IP addresses stored in a database on the server and issued to a computer which requests a new IP address. An IP address is assigned to a computer for a set interval, after which, the computer must renew the IP address or acquire a new one. 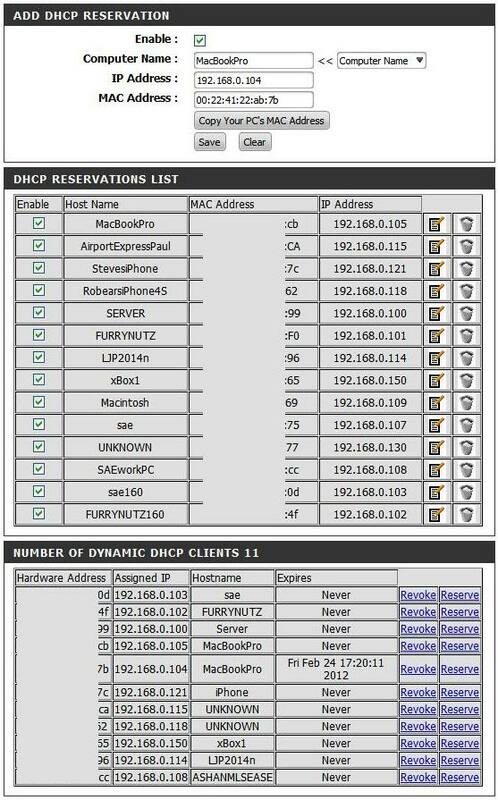 DHCP allows computers (clients) to be assigned settings from a server in a client-server model. DHCP is very common in modern networks and is used in home networks as well as larger campus networks. In home networks, the Internet Service Provider's server may assign a globally unique external IP address to a home router (or modem) and this IP address is used in Internet communications. The home router (or modem) may also use DHCP to supply a usable IP address to devices connected to the home network, allowing these devices to communicate on the Internet. The global unique IP address assigned by the Internet Service Provider (ISP) is different from any of the IP addresses assigned to the devices connected to the home router. This is because of a design consideration of IPv4 to help conserve IPv4 addresses. 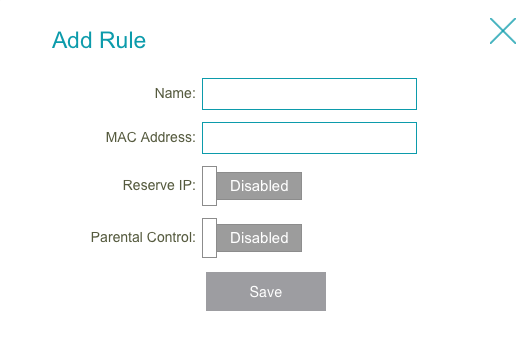 Preferred settings for a Reserved IP address of the devices on a router so that the IP address does not change for the devices. Ensure devices/consoles are set to Auto Obtain IP Addressing. A Reserved IP address is used in these settings. Usage is so when we open up ports or set up QoS on a router, we don’t want the IP address of the devices to change. Some infrastructure situations have to use static addressing, such as when finding the Domain Name System (DNS) host that will translate domain names to IP addresses. Static addresses are also convenient, but not absolutely necessary, to locate servers inside an enterprise. An address obtained from a DNS server comes with a time to live, or caching time, after which it should be looked up to confirm that it has not changed. Even static IP addresses do change as a result of network administration. Most Home and Small Business class routers have limited reservation pools or resources. When this happens, using static IP addresses out side of the main router DHCP IP address pool is suggested for those devices who's Internet access needs are limited or not needing much, if any Internet access or bandwidth. When Static IP addresses are used on devices, users should note that most router features like QoS or Status may not manage or have any effect on these devices using Static IP addressed that are out side of the main DHCP IP address pool range. QoS and most other router features depend on device IP address to be with in the main DHCP IP address pool for correct router management for those devices that need it. IP addresses are most frequently assigned dynamically on LANs and broadband networks by the Dynamic Host Configuration Protocol (DHCP). They are used because it avoids the administrative burden of assigning specific static addresses to each device on a network. It also allows many devices to share limited address space on a network if only some of them will be online at a particular time. In most current desktop operating systems, dynamic IP configuration is enabled by default so that a user does not need to manually enter any settings to connect to a network with a DHCP server. DHCP is not the only technology used to assign IP addresses dynamically. Dialup and some broadband networks use dynamic address features of the Point-to-Point Protocol.